Jack Hoban (J): What is natural food for a Japanese is not natural food for a foreigner. Do you think that the diet should be different for each country? H: I think it's obvious that dietary habits differ from country to country. 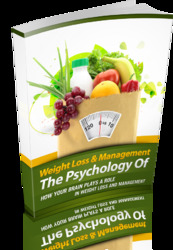 But one thing that is important is to know what a great effect diet has on a person's character and on health. Food and health, food and character. It's often said that if children eat a lot of junk food, it tends to make them rough and violent. And if they eat only meat, for example, they can become very wild, almost like animals. That may not always be so, of course. But it seems that if they drink milk, as well as eat a lot of meat, some degree of balance may be achieved, so that their behavior is more controlled, especially if they also have plenty of vegetables, and so on. As far as my own eating habits are concerned— well, at first, I was not very healthy and was too fat, so the doctor told me to lose weight. I went on a diet of unpolished rice, and vegetarian food including tofu and natto.1 I'm embarrassed to admit it, but I was really so fat, and I used to eat anything; I had a waist of about 44. inches and weighed over 200 pounds! I started getting ill. I'd really been foolish about my body, overestimating its capacities. But then I realized how much harm I was doing to it. After that, I started eating raw vegetables at the beginning of a meal, then unpolished rice, and finally, some low-calorie food. In three months on this diet, my waist returned to about 35 inches. Anyway, with this rice and tofu, vegetables and so on, I had no salt, sugar, or other seasonings or flavorings. By avoiding such things, one can keep one's body free of most harmful substances, and one becomes sensitive to other toxic chemical food additives. If you always eat palate-pleasing food with a lot of seasoning, you lose your sensitivity to these things. In the old days, I often used to visit Takamatsu Sensei's home, and his wife would always serve tea. Each time she did so, she would say where it came from: "This tea is one grown in Uji," or "This is the tea of Shizuoka," in her old-fashioned way. On some days, she would make tea fifteen or twenty times, and every time it would be a different kind. I really used to enjoy it, drinking her teas. One day, all of a sudden, Takamatsu Sensei challenged me, "Do you know what kind of tea this is?" I was quite taken aback by this. "If it were poison, what would you do?" he went on. Indeed, you can't protect yourself against every poisonous substance by tasting it and remembering the taste. It's a matter of the sensitivity of your taste buds, a matter of perception. And as you develop this sensitivity, you get to realize what should not be eaten or drunk. Singer and guitarist, former Marine captain Jack Hoban seems to pick up the feeling that I try to teach through his musical sensitivity. strong are avoided as much as possible. The ninja practices an "odor-free" discipline: he avoids garlic leeks, all spicy foods, salty things, oily things, and so on. If his body gives off the smell of something he has eaten, for example, when in hiding, his adversary may become aware of him. On the other hand, if he does not eat such foods, he becomes far more sensitive to external stimuli. As my teacher used to tell us, when in the mountains, the ninja is usually nowhere near women, and he eats only mild foods. As a result, my teacher said, the ninja becomes so sensitive that he can become aware of a woman who might come into his general vicinity, even without actually seeing her, and he can also tell her age and even her occupation. And fasting also is probably a useful part of the ninja's discipline, for the same kind of reasons. I had an experience of a really strict fast when I was ill, and for about eighteen months I had only a pot of yogurt every day—as some of you know. That was really amazing for me. I wasn't even in a fasting center. I feel that it was a kind of divine gift for me. Or rather, it was the illness for which I feel so grateful to the Almighty. J: Japanese people are structured differently than Westerners. Does that mean that natural taijutsu would look different for aAWesterner than for a Japanese person? H: Well, you know, in Japan people often say that Westerners are weak in the hip area. Our ways of life are quite different, right? Because Westerners use chairs, whereas the Japanese sit down on the floor, their hips are weak, according to Japanese people— martial arts people, judo people, everyone. It's become a cliche here. But it's quite untrue: people from the West have very strong hips. Their area of weakness is actually the knees. For anyone with long legs, the knees are bound to be a bit weak. The hips are strong. So when Japanese want to strengthen their own hips, it's their knees that they work on. What Westerners need to concentrate on is their way of walking, to improve that. I told you just before, when we were standing up, didn't I? You're standing with your knees locked; you should try keeping them a little bent. And every day, when you walk, you should keep your knees bent and take only small steps. It's not so much for health that you need that, but for your training. Also, when I am sitting, like this—hmm?—I sit with my legs folded. The adductor muscles, which bring the knees together, are kept stretched, you see? This is good for strengthening kicks and for loosening up the hip joints. And then, Doron, you see, you sit with your back hollow. Is this from your Feldenkrais work? No? Well, I don't know why, but anyway, I suppose you sit like that naturally. Takamatsu Sensei used to sit like that. When he got tired he would always stretch his spine backwards. Then he would sit like this for a while, and then stretch back again, and he could go on like that for long periods of time. When people fall into depression, they tend to slump, like this, right? But when they're enjoying themselves, they open up their chests like this, perhaps with mouths open in laughter, too, hmm? Of course, in order to maintain one's balance, probably in some disorders of the autonomic nervous system, it's important—as well as pleasurable—to extend the spine from time to time. You should constantly watch things like this. J: You said in your book, Hiden no Togakure-ryu Ninpo—and I am paraphrasing this—that an evil person will naturally give a victory to a person with a clear heart. Could you elaborate on that? H: Well, the most important thing to remember here is that the person who does dishonest or evil things is not properly aware that what he does is bad. This is one point. Now a person of good will has the ability to repress undesirable behavior. This is nin, 4 the nin of ninjutsu. This idea exists, of course, in religion, too, and in Zen: ninniku seishin5 There is a saying, "Enduring insults and humiliation, I drop all rancor, I desire no revenge," which implies bearing no hatred and holding no grudges. Christ taught the same, when He said, "Love your enemies." This is tremendously important in our lives—indeed, I think it is the foundation: the power to show forbearance, the strength to restrain oneself. This is essential in training. For example, people come to a martial arts dojo and may undergo some pain in practice, right? They are in the role of receiving attacks more and more, and then, as their taijutsu improves, their training comes to involve dealing with attacks at a psychological level, too. A person who can endure this patiently and with perseverance without losing his equilibrium will achieve a great deal. 3 A band of cloth wrapped around the abdomen, worn generally by older Japanese men, to prevent chilling of this area. 5 The spirit, or attitude, of forbearance and fortitude. (That's why a ninja's clothes are sometimes known as "the armor of forbearance.") And the temperament of a ninja may be observed in this way. The uniform is like the kesa6 of the Buddhist priest, and Takamatsu Sensei used to call it "a taste of Zen." J: The mass media image of the ninja includes constant reference to mudra,7 jumon8. Did the ninja really have their own finger-entwining system that was separate from that of Mikkyo,9 which you can read about in any book on the subject? And do you teach it? Why or why not? When in the training would anybody be taught this kind of thing? Also, can a non-Japanese person who does not really understand Eastern religions find any real value in kuji,10 in your opinion? Is kuji also included in the teaching of taijutsu? And are the mudra required—I mean, do we have to practice the mudra to get a high level of kuji feeling? I know that's a tough question, but. . . .
6 A brief surplice worn by Buddhist priests. 7 Mudra (Sanskrit, meaning seal, symbol): one of many codified symbolic gestures or postures, especially of the hands, sometimes said to have psychic effects. 8 Chant, incantation, curse, the chanting of a kuji (see note 10). 10 Literal meaning: "nine Chinese characters." A short phrase said to have the power of a spell over an opponent when spoken or intoned by a full-fledged ninja. pretations, including ideas like, "Don't go too far," "Do not teach the most extreme methods," and "Even in victory, do not kill or maim an opponent." As for shippin, the sum was 5, and 5 was said to be the highest number in the Age of the Gods in Japan—the highest in a religious sense—according to tradition. But I probably haven't made that very clear to you. Takamatsu Sensei said that this whole thing about the 9 and the 10 was related to Buddhism, but he also insisted that both religion and martial arts are seeking and working toward the same goal and that the 9 and the 10 are in this sense the same. I believe, too, that the ultimate aim of Mikkyo and of Christianity is one and the same. Do you understand? It's a bit difficult. . . .
D: Yes, yes, that's fine, Sensei. Thank you. So could you please go on to the second part of Jack's question about the kuji? Do you teach it? And why do you do so or not do so? H: Oh, yes, I teach it, I teach it. But rather than memorizing the kuji, it's better to perfect your taijutsu. You see, if you tried to learn the kuji "Gakorai tosha akuma judo," which, if it's intoned properly, can stop an opponent from moving, or "Fudo mugo," which can bring about a loss of sensation in an opponent, it would be absolutely useless, until you had perfected your taijutsu. And so, as I said before, my teacher used to say that when a person is really accomplished in taijutsu, astonishing things begin to happen. Every one of you here knows this. For example, in the U.S., when Stephen Hayes tried to hit me on the head from behind— well, you're meant to intone the kuji, right?—but even without my saying it, he couldn't hit me, could he? And so I told him that that was what kuji meant. Of course, inexplicable things like this happen in religion, too, for example, in Buddhist training; and without thinking, or perhaps even knowing, about things like the kuji, many eminent Buddhist priests have done such things. And Christ, of course, performed many kinds of miracles, as you know. D: So when does one begin to learn the kuji? H: When your taijutsu is perfected, I will teach you then. When a person's taijutsu has reached a level of development suitable for the kuji, I will teach him. If I did not wait, the results could be disastrous. If I taught it too early, the student would probably just get hurt. Anyway, people who aren't good enough don't particularly want to learn it. Also, it's got to be taught correctly. The instructor has to teach it correctly, as I would. When the student is at the right stage, is of sufficient caliber, I will teach him the kuji. It would be extremely dangerous to teach somebody who is not suitably prepared: it could result in his death. To put it simply, if in a critical situation he tried chanting the kuji thinking that he would disappear, and then didn't disappear, for example. . . . Well, you understand? D: Yes, I see. And would you teach it to foreigners as well as Japanese? H: Oh, yes, I'll teach anyone whose taijutsu is good enough. But there is still nobody who has reached that level. Even in Japan, there are very few such people. And that's why I haven't taught anybody yet. In fact, it's just as if it doesn't matter whether the kuji exists or not. D: But you know, Sensei, there are people teaching it all over the place! H: Yes, but the simple fact is that there is not a single person who knows how to. It's simply a fraudulent affair. Teaching an unqualified person and then telling him, "Oh, you can do the kuji now," is just a fraud. Only somebody who has the capacity can do it. Just the same as the fifth dan test—which is not . Dr. Masaaki Hatsumi hing you can teach—the kuji can't really be t, and until a person has mastered taijutsu, > no point in trying to use it. And then there was Jack's question about Ler the teaching of taijutsu includes kuji. Yes, there's kuji in taijutsu, kuji in kenjutsu, in m, in ninjutsu. . . .
in, are the mudra required to develop a high of kuji feeling? D: What is mudra9. iudra is—ah—the hand position where you en: your fingers. Ah, yes. So, Sensei, he asked whether the mudra :essary for producing the feeling of kuji. \—as in Mikkyo? No, there's no need for it. No, you at after your taijutsu is properly developed. You he 9 and the 10—kuji and the juji11—the nment and mastery that they represent, are out of keeping going, out of long perseverance. >dy knows when it may happen. It varies greatly person to person. For example, in my taijutsu, u know, there are so many aspects that you can't , that you can't teach; even if you are taught things, you can't do them, and even if you try to them, you can't do them. It's just the same with uji: it's impossible to learn, it's impossible to l. It's just like taijutsu. Literally: "ten Chinese characters (as opposed to kuji). The Grandmaster's Book of Ninja Training tious lives. Why do you now seem to seek high contacts? And what do you mean by "white-martial art"? H: In the past, as I've often said, the syst< transmission of a teaching from a master to a : pupil has been pretty rigidly followed. It was : be desirable that each school of budo should be sented by a single person, by the leader o: school's tradition. I think that the number of p who studied in these schools varied according period. But those who had come close to the ' terms of their sense and feeling of the art tha were practicing were in fact the medium, the j ground through which the tradition was transn The kind of people who had that sense were nat spiritually very fine human beings. If they ha been, they would not have been able to appro? close. For that reason, if I am going to teach anyw feel that to teach people who show promise and to have a future in the society in which they people of worth, people I have referred to befo "white-collar" people—to make people of this so medium of my art is likely to contribute more t world, to be of more value to other human being I think that this is the best way for me to pre with my work. To try to teach undesirable pe would be very dangerous: what they learn mig misused, and so on. It's a bit like the problems surrounding the peac use of atomic power. After all, people who hav their own livelihoods get on with their own live: don't go in for robbery and violence and the rest. it's important from the viewpoint of the teacher, as a human being, that his pupils should be peop stable and secure character, people who live pro tive, not destructive, lives in the world. And th the direct ion I want my teaching to go. J: Our training is very gentle and relaxed now, but a real fight has a lot of emotion to it. Now, without starting a fight or sparring, how does one prepare himself for the emotional aspects of a real encounter by just doing taijutsu? H: A real fight is something that cannot be recreated, especially if some deadly weapon is used. Therefore, it's absolutely vital to find a way that will enable one to win and to get into a winning frame of mind. If you can't do that, you will lose. And also, if you are going to really fight somebody, it is essential to know your own ability. For this reason grades are needed. If the opponent looks stronger and more skilled, you make yourself scarce, right? You know when to leave, hmm? That in itself, in my opinion, requires some training. Even if you're weaker, there's a way for the weaker man to win. One formula of budo is this: display your weakness to be strong. Or to put it the other way round, if you don't know this formula then, however strong you are, you can be easily beaten by somebody weaker in a real encounter. D: Sensei, would you say a little more about "displaying your weakness"? H: "Displaying your weakness" means—if you generally appear weak, you don't usually get people coming to fight you. But then, if you are attacked and you have been displaying your weakness, the attacker is unlikely to be prepared for any retaliation. He comes in to hit you, and without any effort on your part he is in range for you. Then you have the chance of winning quite easily, and this sort of thing really happens. So it's quite different from a sport, because if the fight is in earnest and you feel that you're weaker, you'll stay away from danger, from where the opponent is strong. But if you happen to find yourself in danger, then you use whatever means you can—taijutsu, whatever, depending on the situation. For example, if you think you are weaker, you might use a pistol. If a person is unaware of this simple formula, and he starts thinking, "Well, I've been studying ninjutsu, and I'm pretty good now," he might easily get killed—I might get killed myself, if I did that. Let me make it quite clear: this is what budo is—recognizing your own capabilities and your own weaknesses, however strong you may be. Some people do know this, though, even if they have had no experience of budo training. A man may well be killed by a woman—after all, pistols are available in many countries. Please think about this carefully: it's important. However strong a man is—he might even be a world boxing champion—in this day and age, someone just has to pull a trigger, and he's dead. If a person doesn't think about such simple things and doesn't attach any importance to them, when it comes to the real thing, he could lose his life at the twitch of a finger, whatever dan he might have. It's necessary to remember this. So nobody should imagine that martial arts are somehow almighty. A man must realize that he is alone in the world, and he needs to know his level of ability as far as fighting and conflict are concerned. Many, many martial arts people don't understand this—they're brainwashed by their teachers to think that their own budo is the strongest. And there are even schools where the students—even the teachers— are quite happy to be brainwashed in this way! This is a terrible thing to happen., Being brainwashed is just like being blind, and so I have absolutely no desire to do it to anybody. What I always want is for you to purify your heart (heartwashing! ), and that's why I give you this. H: "Shikin haramitsu daikomyo." OK.
12 This phrase is used as a prayer or salutation at the start of a ninjutsu training session. J: You seem to consider ninjutsu training to be rather straight-line taijutsu training only. How do you feel about people adding other things—other practices and teachings—to the training? Do you care about it? What do you think about it? H: I feel that, in the circumstances in which those people work, and with the values that they have, it's fine. If their ability in ninjutsu is so limited, it can't be helped. It is important that they should do what they can to help their students understand, and so as to do that, they may make use of these other things. But of course, taijutsu must be made the basis—the main ingredient. If it isn't, what is taught becomes like an overdiluted cocktail where the alcohol no longer has any effect, or like food without any flavor. It's all too easy to go wrong in teaching ninjutsu. J: Can you tell us a little bit about the other students who studied with Takamatsu Sensei? For example, could you tell us some more about Mr. Akimoto? H: Indeed, I think that Akimoto Sensei was a true disciple of Takamatsu Sensei. He was a gentleman who observed the traditions carefully, and he really understood his own system of values well. For example—you see, he was my senior in budo, and when the title of Iemoto was handed down to me by our teacher, although I was far younger than Akimoto Sensei, he was really happy for me. I was still at that time not really much of anything, and from Takamatsu Sensei's point of view, Akimoto Sensei had many far more developed skills than I did. For example, at the Tone River once, he was wearing a sword, and a skylark suddenly came flying past. In a flash, his sword was out, and the dead bird fell to the ground. That shows the level of skill he had. I have heard many tales of his martial exploits, and I know a lot of stories of his encounters with prominent budo men whom he defeated. 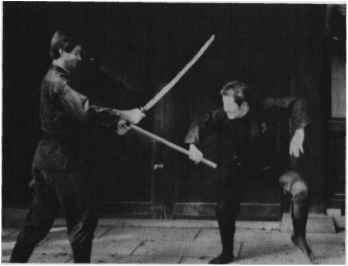 But the really important thing to realize in budo is that technique alone is worthless if the man loses his equilibrium, his inner balance. If a man does not have some other major strength, it does not matter how far he develops his technical skill—he will be beaten in the end. So I reckon that Takamatsu Sensei probably felt that a person needs to be born with some other major talent whereby such a situation can be prevented. 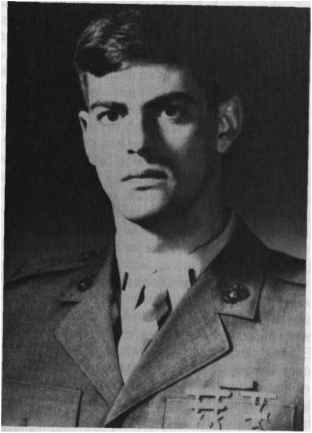 There were many others senior to me who were also more skilled than I was, but I suppose now that I was the guy who, in my teacher's view, could preserve this tradition that had already been handed down for over nine hundred years and who could keep it alive satisfactorily one way or another. Then, Takamatsu Sensei died, and for fifteen years I have been thinking, "Oh, things are not satisfactory. . . . I've got to do better This won't do " And now, I've just awakened, now that I've been to America and back as Grandmaster of this school, to the fact that things are OK, and progress is being made. As Grandmaster, I've now introduced myself as Toratsugu, the name that Takamatsu Sensei allowed me to use. And then, as if in reply to all this, I was elected to the Black Belt Magazine's Hall of Fame as Instructor of the Year. To me this was as if Takamatsu Sensei were saying to me, "It's OK, young feller. You can call yourself the Iemoto . . . that's fine now!" The timing of the news of the Black Belt award, which came just as I decided to assume the title of Iemoto, was like Sensei remarking, "Yes, all right, that's fine. Call yourself Grandmaster, too, if you want to, son! You've done pretty well so far—I can see that . . . !" This is what occurred to me at the time. And quite apart from any happiness I felt, I thought of what a great gift this was for everyone in my budo, and I hoped that I would be able to pass on the teaching correctly to everyone. I even hoped that I would in this way be able to repay my debt to my own teacher. J: Your ranking system seems to be based on how much the person understands the feeling of your training, particularly for foreigners. Yet the rank certificates say "ninpo taijutsu" Are you worried that some people will teach bad taijutsu? H: No, I haven't been worried about that sort of thing at all. There'll be books coming out on it, as I have said. But, you know, with a person of ill will, his true nature shows itself in the way he moves. It's really an amazing thing how he shows his true colors in his taijutsu. But as I've often said, the true sense of each person's grade is confirmed by everyone's positive response and recognition of the grade. It is so much better for everyone to recognize it than for me just to decide in isolation. Here's a good example: the fifth dan test is done in front of the other students, right? And the candidate carries the good wishes of all the others with him. I feel that it's really important that a student should carry the blessings of the others to his new grade and feel their support and joy when he gets it. From now on, when instructors are teaching in other countries—instructors who have not come to Japan—it should generally take about three years to reach shodan. This is important. Instead, though, if someone comes to me in Japan and has some kind of understanding of the feeling of my art, I'll promote him more quickly. This is because we will need instructors soon, all over the world. But I hope that some of these people, on returning to their own countries, will come to realize that they can't go far on their own. For example, they will see that the feeling alone is not enough, and when this happens, those who are really serious and genuine about it and are aware of their shortcomings can go to Jack's place or to Doron's to learn. The time has come now for this. The timing is good, and I'm very happy about it. But the ones who do not recognize their own inabilities will simply lose their own pupils, sooner or later, when something goes wrong. OK? J: This is the last question. It's a long one. In history, businessmen and warriors are always portrayed as being of separate philosophies and motives. Do you agree? Can there be such a thing as a warrior-businessman? And should his training be different in any way from regular taijutsu? If you want to attract white-collar people to the art, they will have to see the value of ninpo in terms of their professions. Do you agree? 13 The Edo, or Tokugawa, Era lasted from 1603 to 1867. 14 The Civil Wars Era (Sengoku. Jidai), which gave the samurai plenty of fighting to do, had ended not long before the Edo Era. iki Hatsumi wn to us. Just as long as the core, the essence ling, has been preserved, it is fine. This is e people in every era who, however ad-nvironment, are not corrupted, do not be-nerate. In a similar way, ninjutsu has sur-:orrupted and healthy, for close to a n, through a wide variety of circum-Lis is a fact. After all, everything that is not healthy—plant, person, enterprise, or s to fall by the wayside, to die, to disap-this is why I have resolved to maintain the lis thousand-year-old tradition with all my strength. 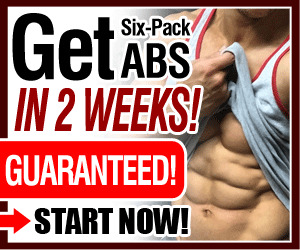 The kind of thing that destroys 2 and endangers health is people's lusting and fame and fortune and power. But the st be maintained strong, true, and d.
essful 5th dan test. He has beautifully avoided the ng down from behind by rolling aside (oten>). This is ;tudy of egins. j arts are led with they 5long to own us. 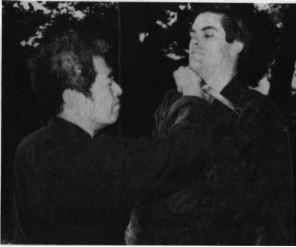 Jack Hoban with the author, practicing shoto shirahadoi the attacker tries to cut, the chin is used momentarily to the hand. Jack is very quick at finding the weak points of a weapo taking advantage of them. He's got guts! Jack has just published a book on ninja bojutsu techniqi so let's see how he looks on the receiving end of such ; lesson! 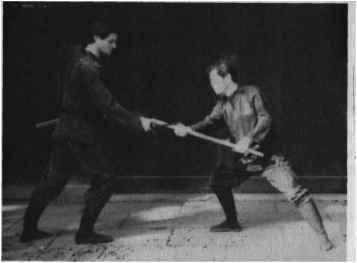 Holding the hanbo (short stick) in one hand like a walkii stick, let's practice using it either for attacking or for defe and counterattack against an assailant (Jack) with a she sword. 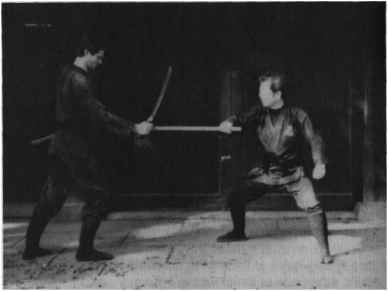 First, the hanbo is swung with the right hand from the right side to attack the opponent's fingers holding the sword. Then, the stick is swung up from below to hit the right wrist or hand. Lowering the posture makes this strike more effective. 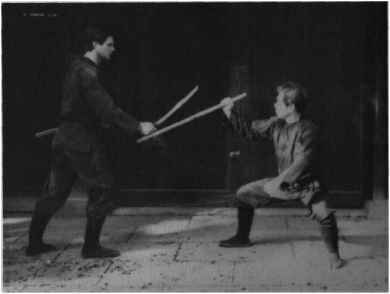 Here, against a full-length sword, the defender springs up, striking the wrist either on the way up or as he lands. 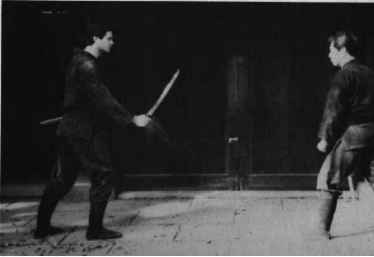 After this strike, the stick is swung back into the left hand, and the end protruding beyond the gripping hand is used to rap Jack's wrist once more. As the stick is swung forward again with the right hand, yet another blow can be delivered to the wrist. It is essential that mind and body work together in harmony if any high degree of skill is to be achieved. For this, a weapon hat to become an extension of the ninja's body. Following the above moves, the attacker's right hand can be trapped under the arm. 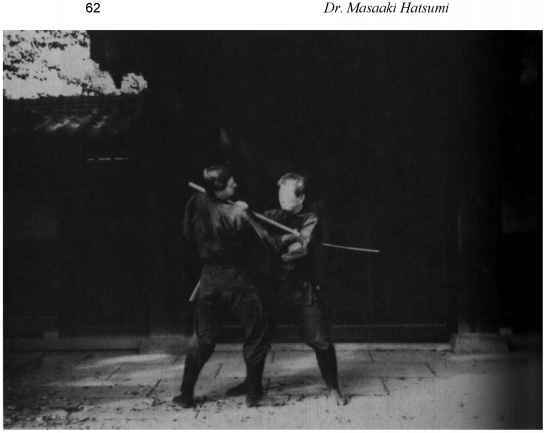 Simultaneously, the right hand is slid up the hanbo, using it to attack the left side of the neck. Next in sequence (not photographed), Jack's right hand could be broken (kisai-gata) as part of the natural flow of the defender's movement. 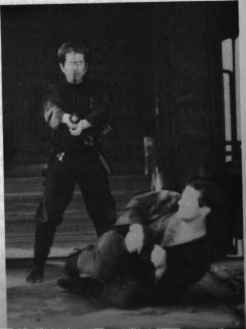 As these photos suggest, only if a person is accomplished in taijutsu can a weapon "come to life" in his hands and be used efficiently. How to do gakorai tosha akuma fudo?